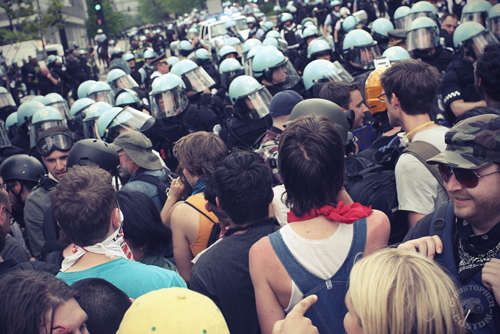 The following is a photographic essay from the recent "NoNATO" demonstrations in Chicago. 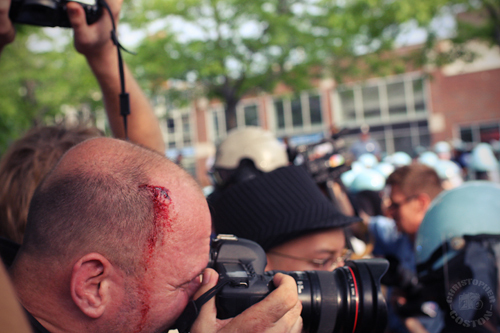 Freedom of the press: a concept lost on the club-wielding Chicago Police Dept. And the award for bravery this past weekend goes to these kids. 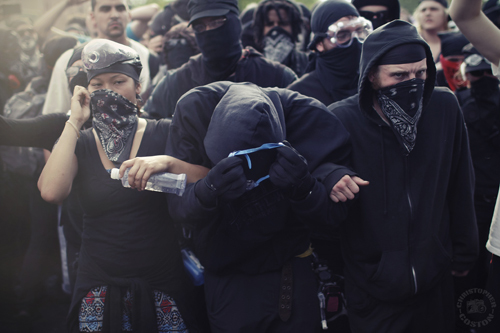 Undeterred by an arbitrary police order to disperse- and thus relinquish their rights to free speech and to freely assemble- this group of young protestors decided that, even in the face of threats of violence, they would hold their ground and defend their right to be there and have their voices heard. 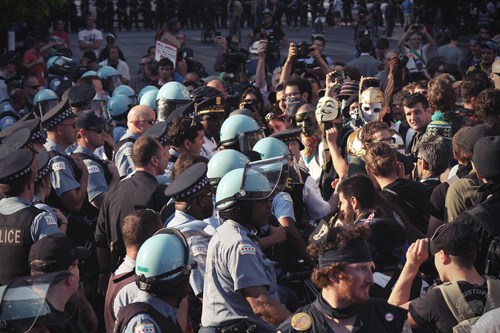 This was taken just moments before a flurry of CPD batons would connect with their bodies. This photo was taken as Chicago police officers, in full riot gear, began beating protestors for demand their First Amendments rights were respected. In the background is a Long-Range-Acoustic-Device- a piece of military hardware deployed in Iraq and other warzones that utilizes and intense sound canon to disorient and disperse crowds. There have been many cases of permanent hearing damage resultant from its use. 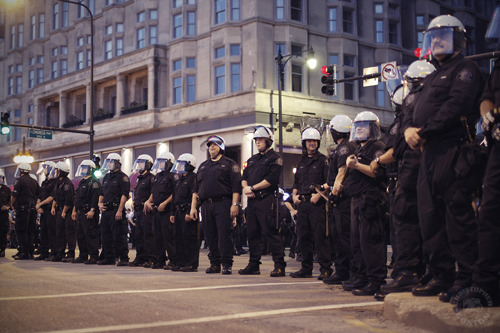 The police presence in downtown Chicago could only be described as ludicrously excessive. 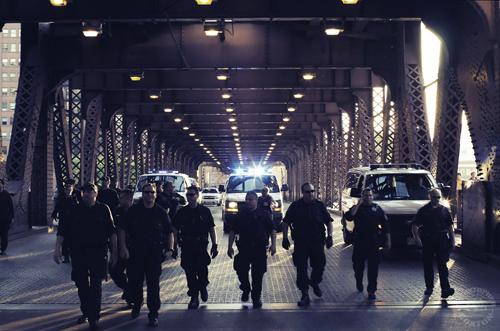 It was meant a show of force to intimidate those who opposed a state-sanctioned meeting of war-criminals in Chicago (or anywhere) and deter protest activity. 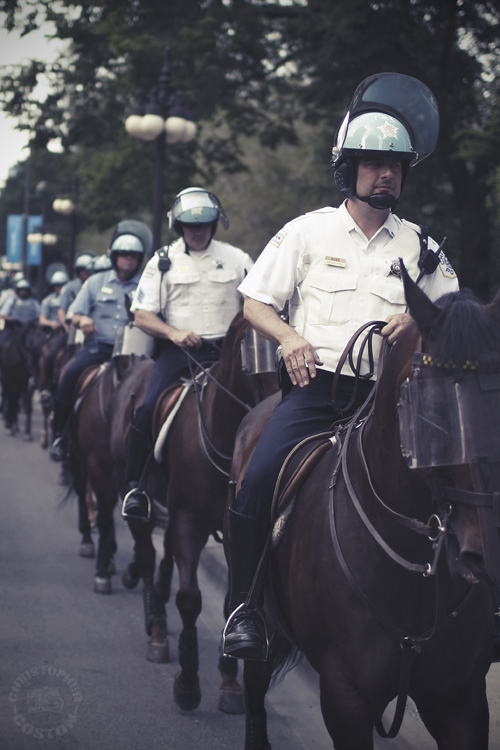 Mounted police were a ubiquitous sight during the course of the NATO Summit. Meet Nan. She came all the way from Portland, OR. 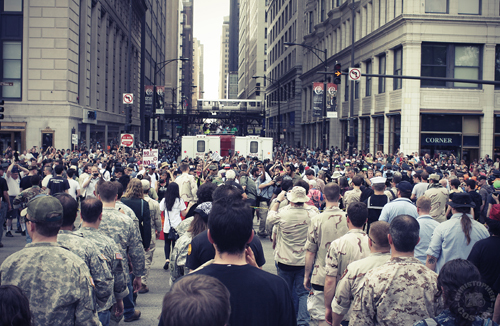 This was taken on Saturday, May 19th during an "illegal", permit-less march protesting NATO that lasted all day long and went into the late evening- shutting down entire portions of downtown Chicago in the process. 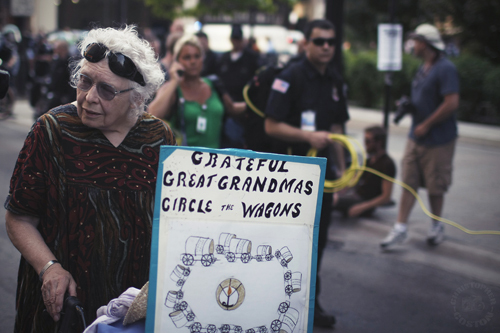 She, with the aid of her walker, was with the march all day. This Army veteran returns his medals back to the NATO war-criminals who gave him these cheap tokens in hopes that it would help cover up the shame of taking and ruining the lives of so many. This was the staging ground for the official Sunday, May 20th march that would run from Grant Park to McCormick Place (the venue of the NATO Summit), culminating in the ceremony where veterans from the Iraq And Afghan wars would return their service medals by throwing them over the security perimeter that lined McCormick Place. 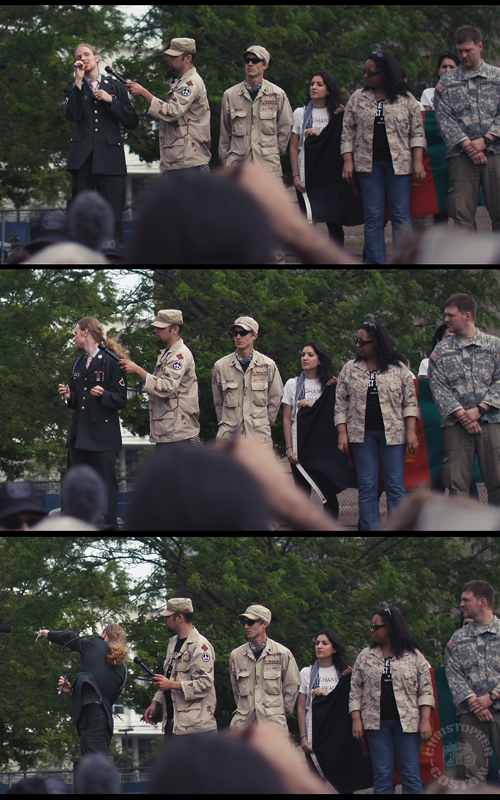 These men and women began the process of healing and reconciliation by publicly returning the medals they were given for service in Iraq and Afghanistan; throwing them over the barrier that the NATO war-criminals were hiding behind. 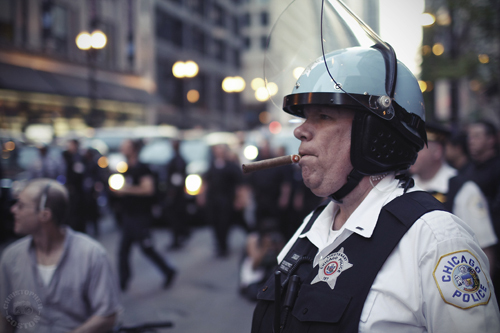 A Chicago PD Lieutenant wastes the city's money as he is paid double-time to leisurely smoke a cigar this past saturday night. Meanwhile ex-Goldman-Sachs-employee-turned-Chicago-Mayor Rahm Emanuel closes neighborhood clinics due to a "lack of city funds." What you see here are the local, paid thugs working to stifle dissent aimed at the tyrannical policies of the global financial elite. 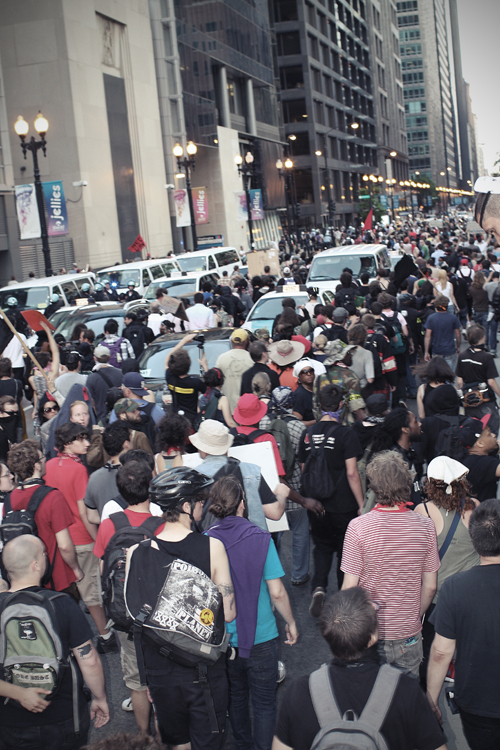 Saturday's permit-less march enters its 8th hour in downtown Chicago. 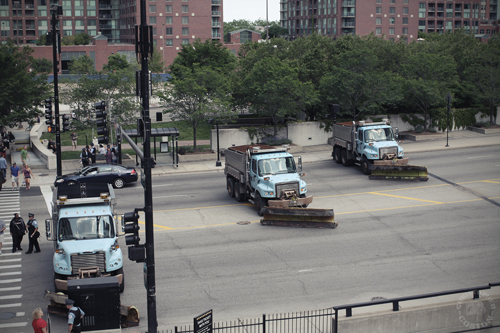 City of Chicago Sanitation Dept trucks are used as roadblocks to cordon off areas of downtown Chicago deemed Secured Zones. Protestors marching on Saturday, May 20th clash with police who are trying to force the marchers along a route of their choosing. 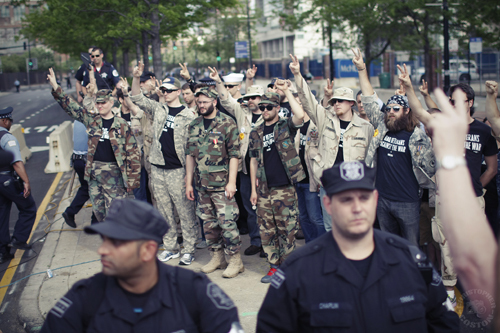 Veterans of the wars in Iraq and Afghanistan, organized by Iraq Veterans Against the War and Afghans for Peace, lead the official Sunday, May 20th march to McCormick Place- the venue of the NATO Summit. Between 7,000 and 10,000 people were thought to have joined in the march. 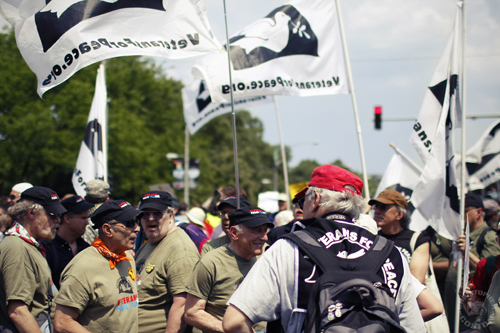 The anti-war group Veterans for Peace, representing veterans of US wars spanning the past 70 years, marched alongside the latest generation of US war veterans.